I have been so eager to get my hands on a copy of The Stokes Field Guide to the Birds of North America. I'm a big fan of Don and Lillian Stokes, their birding products, their bird song cd's, their blog, and especially their enthusiasm!...which you can follow with me @stokesbirding on Twitter! Don and Lillian were kind enough to provide me a review copy of their fabulous new field guide. It is a photographic field guide which I feel best captivates readers, especially new birders and youth. You can't help but be sucked into the pages when you see the stunning photos. When my kids got home from school today, my daughter caught a glimpse of me perusing this new guide and she exclaimed "Whoa! Can I see it?!" This Stoke's guide largely overcomes, and perhaps surpasses, the advantage of illustrated guides by having multiple photos of each species. The more challenging the identification and the more variable the plumage the more photos and even more pages are dedicated to that species. The sections on hawks and gulls are perfect examples of this special treatment. The Red-tailed Hawk gets four whole pages! The eye-catching photos are pooled from top bird photographers in North America, including Lillian Stokes herself. This is by far the most comprehensive North American field guide I have in my possession. Check this out! 854 species, from rare vagrants to your favorite backyard birdies, are included using over 3,400 photos! Just to make sure it was comprehensive I looked up Siberian Accentor, which was a vagrant seen in Idaho a few years back...Bam!...there it is on page 580. The little code in the bottom corner indicates the photo was taken in the month of February in Idaho!!! This new guide also discusses all subspecies and hybrids that birders might come across in the field. I thought I'd put this claim to the test to. I wanted to see if there was mention of a Violet-crowned Hummingbird x Broad-billed as I had seen at Arizona's Boyce Thompson Arboretum...Bam!...there it is in the hybrid notes for both species on page 417 and 421. Awesome! There are no arrows pointing to key traits of the bird, so you actually have to read the descriptive text. I know that is shocking to those of us that have become accustomed to Peterson and Sibley. It is amazing how much you can learn by actually reading something. Stokes even provides descriptions of "perched" and "in flight" hawks! This field guide is so chock-full of quality photos, complete descriptions, maps and so forth that it ain't small. Its one thick book. I weighed it on the kitchen scale and it comes in at a hefty 3lbs. ...solid muscle though and no fat! It's not the kind of field guide you'll be carrying in your vest or hip-pack, but you will certainly have it at-hand in your car and on your windowsill. The pages are color-coded by section for easy navigation. It has a nice weather-resistant cover. The Stokes prove that they know birder's needs as the "quick index" is right on the front inside flap...Perfect! The photos in the Warbler section are eye-candy! This is the most up-to-date field guide on the market. Revised names and distribution maps are all there. It even includes the Pacific Wren! Paul Lehman provided the updated range maps. As a cartophile, I'm critical of range maps for the bird species that I know and love in Idaho. Almost all the maps are pretty darn accurate for Idaho species. A few are off a little, but within reasonable tolerances. I'm still waiting for that field guide that boasts using eBird data to aid in drawing their range maps! Only then will I be truly happy with range maps. (We citizen-scientists want to feel like we're contributing!) There are so many nice modern features that make this field guide extremely useful and user-friendly. I could go on and on. Don & Lillian, Thanks for the nice personal note on the title page! Well done. Every self-respecting birder will want to have a copy of this fantastic field guide. Yet another quality product from the Stokes, the endearing Ma & Pa of the birding world. 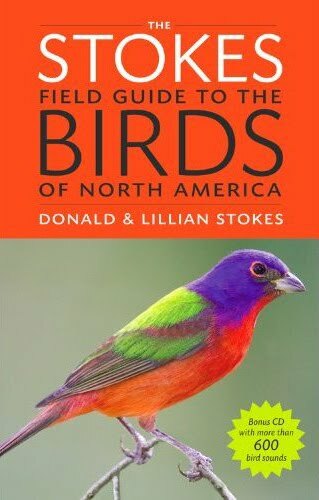 The Stokes Field Guide to the Birds of North America is currently listed on Amazon for as low as $16.49. That's like half-a-cent per picture. What a bargain!!! Oh, don't forget the bonus CD which comes with 600 more songs and sounds to add to your Stokes Bird Song collection! fabulous post!! i like this very much. i love bird. i have a parrot who speaks in our language. Thanks so much for your fabulous review!! You got me convinced, I got to have this guide! I am going to order it from Amazon right now.